Your ears, fingers and soul will be soothed by the extraordinary sounds that a Schneider Guitars handmade electric guitar will produce. Each is tuned to perfection. 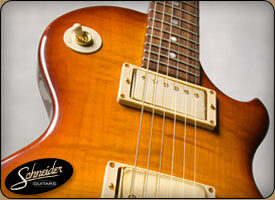 Any part of a Schneider guitar can be customized to suit any taste. Rely on our 30+ years of guitar building experience and don't be afraid to dream. Check out our fine electric guitars. And when you are ready, call Dave at 845-684-5566 to schedule an appointment. The top is hand carved quarter-sawn highly figured maple with back, sides and neck in Mahogany. The head veneer is burled mahogany. The fingerboard beautiful rosewood. This is a guitar you can grow into and a guitar that will develop your full potential as a musician. The top is hand carved quarter-sawn European figured maple with chambered adn tuned one piece mahogany back and sides. The neck is Mahogany. The head veneer is Ebony with exotic "flame" opening. The fingerboard Ebony with hand inlaid pearl block inlays. This electric arch-top design combines the electric sound of a solid body and the acoustic sound of an arch top - a versatile instrument for any type of music - ensure that your breath WILL be taken away. This "Strat" style electric guitar is handmade using fine Mahogany. 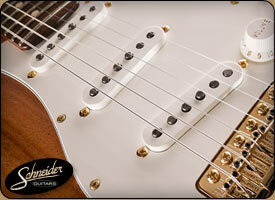 It has silver wound Seymour Duncan Zephyr pickups and top-of-the-line custom electronics. 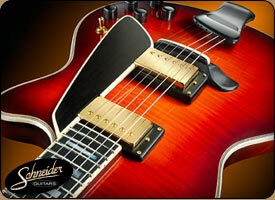 It sports all the fine craftsmanship that musicians expect from a Dave Schneider guitar. Wow what a warm, smooth, sustaining sound. » Schneidocaster Handmade Mahogany "Strat"
This solid body bass guitar has Honduran Mahogany back and neck, Rosewood fingerboard and Figured Maple top with active Jazz Bartolini pick-ups. Complete with a Schaller bridge and tunning machines. 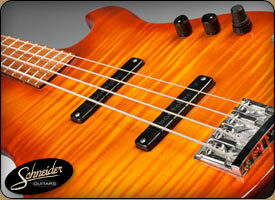 The Nitro Sunburst finish makes it look as smooth as it sounds. "I plug my jazzmaster in, tune, and begin to play. I could only grin. I know I just heard the tone that fell from heaven. The clarity, the harmony, the unbridled POWER I had slung around my shoulder is something I have never known."